There is likely no film phenomenon quite like The Rocky Horror Picture Show, the 1975 cult film by Jim Sharman based on the Richard O’Brian stage production has become a staple of midnight screenings where fans dress up as the characters, perform and shout back at the screen. Fox TV has now tread on hallowed ground with a small-screen remake of the beloved camp classic. The Rocky Horror Picture Show: Let's Do the Time Warp Again, stars Laverne Cox in the role of mad scientist Dr. Frank-N-Furter made famous by Tim Curry in the original. That character was a prescient precursor of gender fluidity and a plum role for Cox to display the full range of her talents, acting, dancing and singing in the musical which requires her to wear costumes even more outlandish than the ones in the original. Interviewed by HFPA journalists, Cox explained how she studied dance and voice in college (her idol was opera singer Leontyne Price), that she has a full octave range and for this role employs both upper and lower registers, her high head soprano falsetto and her low chest baritone voice. She told us her musical performance was influenced by Little Richard and Chuck Berry, Grace Jones and Tina Turner, also by David Bowie. Director Kenny Ortega, who is a choreographer, encouraged her to put a lot more movement in her dancing. 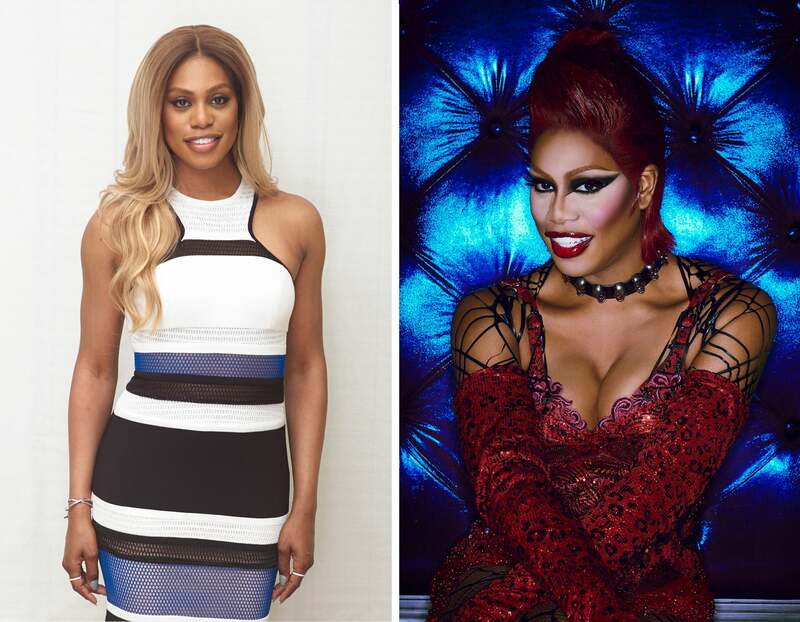 Laverne Cox has been the face of the transgender community since Time magazine put her photo on the June 9, 2014 cover touting her success as “The Transgender Tipping Point: America's next civil rights frontier” after she had been honored at the GLAAD Media Awards that year. In June of 2015 Entertainment Weekly featured her on the cover dressed as the Statue of Liberty, under the headline “America’s Transformation.” This month she was a headliner wearing a lavender dress in a one of the five Variety covers honoring the Power of Women, alongside Miley Cyrus, Ava DuVernay, Scarlett Johansson and Helen Mirren. In her most acclaimed supporting TV role to date, transgender inmate Sophia in Orange is the New Black, Cox has a small arc in Season 4 where she is put in solitary confinement, “for her own protection” after being attacked in Season 3, and attempts suicide. This storyline is reminiscent of the real-life predicament of Chelsea Manning, the former Army Intelligence analyst and WikiLeaks whistle-blower, who in August 2013 was sentenced to a 35-year term, that she is serving in a male military prison despite being recognized as a transgender woman. After a hunger strike and a suicide attempt, Manning was sentenced to 14-days in solitary confinement, but she will finally be allowed to proceed with gender-reassignment surgery.